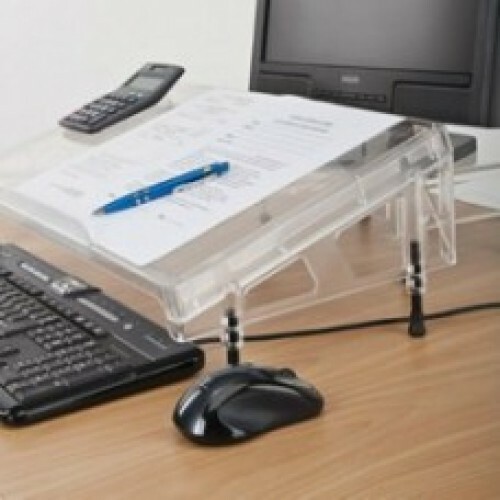 Elevated and angled writing platform for use with single surface desks provides support for documents and books. Avoid bending your neck downward in order to view documents and minimize reaching by positioning document directly in front of you. The Microdesk™ helps relieve tension through positioning your body well while you work. 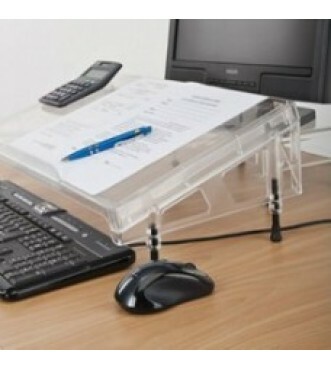 The Microdesk™ suits left and right-handed writers. There is a removable lip at the base to stop your papers from sliding off – don't lean your wrist on the high lip while writing, keep to the side where there is a flat area OR change to the low lip profile. The ruler / line guide is included with all desk models. 22" w x 12"d with two lip sizes: 3/4" and 1/4"